The Bristol Bay Management Area includes all coastal and inland waters east of a line from Cape Newenham to Cape Menshikof, including 9 major river systems. Numerous freshwater nursery lakes and shallow estuaries make Bristol Bay the largest commercial sockeye salmon producing region in the world. The Bristol Bay area is divided into 5 management districts (Naknek-Kvichak, Egegik, Ugashik, Nushagak, and Togiak), corresponding to the major river drainages. The management objective for each river is to achieve spawning escapement goals while harvesting fish in excess of the goals through the drift and set gillnet fisheries. 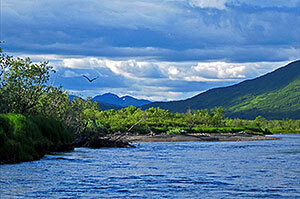 Additionally, Togiak District provides spawning grounds for the largest commercial Pacific herring fishery in Alaska.